I have enjoyed reading the recent posts on Polymer Clay Daily about the Synergy3 (Polymer Clay) Conference that was held in Atlanta - just wish I could have attended. So I was delighted that some of the presentations were being posted for others to look at. Looking at the 'How to How to' presentation by Judy Belcher and Cynthia Tinapple, I was amazed to see two photos (taken from my blog) on one of the slides about 'How to use scrap' - it was my first attempt and making a 'Stroppel Cane'. I feel very priviledged that a tiny piece of my work made an appearance at the conference, even though I could not be there. 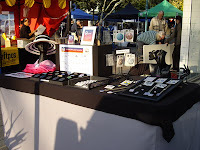 It was a lovely suny day, although quite windy at times (one of the perils of being outside), I had to pin or stick everything down to stop it blowing off my table at the Browns Bay Craft Market. It was nice to be doing a very local (literally up the road I live on) market, even if it did not turn out to be very profitable. This was only the second time the market has been held, and the first time for me taking part. I hope it develops into a viable market for me, as it is nice to support a local initiative. After months of deliberating I finally took the plunge and applied to have a stand at Dunkleys Great NZ Craft Show when it comes to the North Shore Events Centre in Auckland, 18-20 October 2013. I am delighted to have received confirmation that my application has been accepted. My main reason for doing this is to promote polymer clay and advertise my workshops but it will be interesting to see how sales compare with the markets I have been selling at so far, as it will be a different type of visitor to this event. I hope to be teaching a workshop on each of the three days of the show, as well as demonstrating on my stand, and would love to generate enough interest to set up an Auckland Polymer Clay Guild.